Germany's Auto Motor und Sport said there is an issue in terms of promised bonus money in the Finn's 2012 contract, given his unexpectedly large points tally. 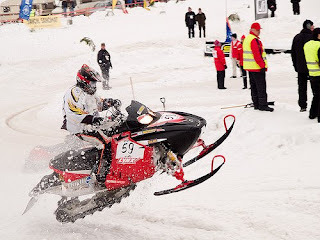 "I don't know where this stuff comes from," the 2007 world champion's spokesman Riku Kuvajan was quoted by the Finnish broadcaster MTV3. "I can't say anything about it." 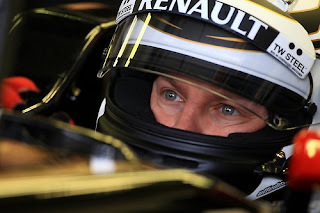 Now, on Wednesday, the German magazine said other staff at the Enstone based team are waiting for their pay-cheques. Auto Motor und Sport said the team's management is holding out for the latest installment of commercial income from the sport's owners, headed by chief executive Bernie Ecclestone. 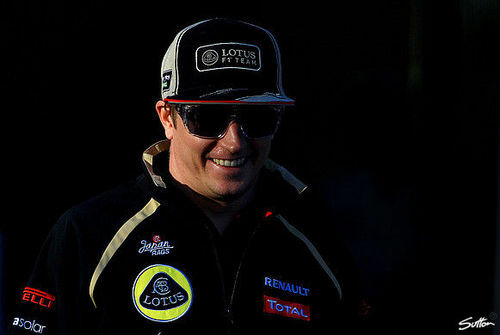 The report said Lotus is waiting for that money to "pay the wages of 493 employees and Kimi Raikkonen". Q: What have you learnt from your return to Formula One racing? Kimi Raikkonen: This season has shown me that I still love racing as much as I ever did. Obviously, I would have not come back to the sport if I did not feel like this. Driving a Formula One car still gives me the same inspiration and I feel the same passion for it. 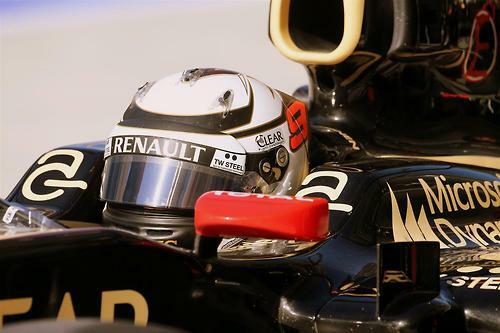 Q: Lotus is your fourth Formula One team: how have things gelled? Q: We, and around 500,000 other people, recently saw you signing an enforced contract on YouTube (in a promotional video for a sponsor). How civilized was the process with Lotus in comparison? KR: I think there were a few people who had doubts about how I would perform after being away for a while. Personally, I didn’t feel I stopped racing at all. I may have been doing something different with rallying, but after coming back to Formula One I immediately felt fit enough - and fast enough - to start racing again. My hunger for winning is exactly the same as always and I think I’ve shown that I’m capable of fighting for victories. Obviously there have been none so far this year, but we have come close a few times and for sure we’ll keep on trying for as long as it takes to start winning again. KR: Of course, the main thing is to do my very best every time, every weekend, every race. I think to be able to perform better in the races I have to find more from myself and from the car in qualifying. This season has shown that you have to be on first two rows to be able to win every time. It’s important to improve our grid positions for 2013. That’s one of the main targets for me. Kimi Raikkonen has given his entire Lotus team T-shirts emblazoned with his now-famous radio message during his Abu Dhabi Grand Prix victory. The 33-year-old Finn took his first win since his return to the sport this year and his team's first since the 2008 Japanese Grand Prix. On Friday 500 T-shirts carrying the slogan: "Leave me alone, I know what I'm doing" arrived at the factory. The T-shirts are black, with the words in gold, reflecting the team's colours. The phrase is a reference to Raikkonen's remarks on team radio during the race. Raikkonen inherited the lead when Lewis Hamilton's McLaren retired with fuel-pump failure. Following Hamilton's retirement, Raikkonen's engineer Simon Rennie told him his advantage over second-placed Fernando Alonso's Ferrari and that he would keep him updated on the Ferrari's pace, to which Raikkonen responded: "Just leave me alone, I know what I am doing." Later, he was reminded to warm up his tyres while driving behind the safety car, and Raikkonen said: "Yes, yes, yes, yes. I'm doing it all the time. You don't have to remind me every second." After the race, Raikkonen said: "I understand the team is just there to try to help and they are doing the same job as I am doing. "But I am not a big fan of being told many things because I know pretty well what I have to do [and] what is going around, so if I have some questions I will ask and they will help. "It's not the first time and it's not the last. It's just a normal thing. People will probably try to make a big story out of it, but it happens every weekend." Raikkonen, a notoriously singular character, said after the race that the victory meant more to the team than it did to him. "It's great. It's more important for the team and the people who work here. They do all the hard work," he said. "I just try to deliver on a Sunday and a Saturday. It is one win for me but for them I think it is a much bigger thing." Raikkonen's last victory was in the 2009 Belgian Grand Prix, when he was driving for Ferrari. 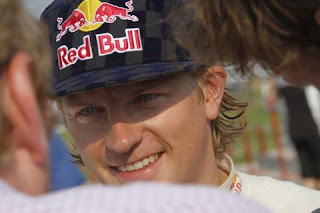 The Italian team paid him off a year early at the end of that season to make way for Alonso's arrival, and Raikkonen spent two unsuccessful years in rallying before returning to F1 with Lotus this season. He is third in the championship behind Red Bull's Sebastian Vettel and Alonso with two races of the season remaining, but is out of contention to win the title. Kimi Raikkonen is hoping for warmer race day weather which better suits the Lotus, while Romain Grosjean faces an uphill climb after a gearbox penalty demoted him to ninth on the grid. 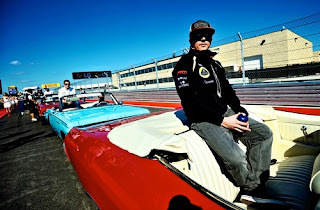 Kimi Raikkonen was pleasantly surprised on two fronts in the first-ever qualifying session at the Circuit of the Americas, ahead of the 2012 United States Grand prix in Austin, Texas. One was the warmer weather that they encountered after a chilly Friday; and the other was the pace of the Lotus in qualifying trim. 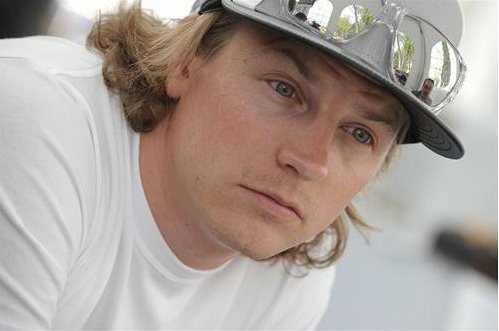 Raikkonen felt that the two were not unrelated. "I was actually expecting a more difficult qualifying session today, but the car was the best it's felt all weekend so it turned out to be quite good," said the Finn, who posted the fifth fastest time in the last part of qualifying on Saturday. "The warmer conditions make the car work much better and that certainly makes a difference." Raikkonen was out-qualified by his team mate Romain Grosjean who set the fourth fastest time in Q3, but the Frenchman has a five-place grid penalty that will drop him down to ninth on the grid and raise Raikkonen up to fourth - which was not great news as far as the former world champion was concerned. "Starting on the dirty side of the grid maybe isn't the best," he admitted, concurring with speculation from some teams that starting on the 'even-numbered' side of the grid could cost a driver one or even two positions off the grid in the run up to turn 1. "It's been very slippery anyhow, the circuit, and then the racing line goes more or less over the right-hand side so we expect it's going to be very slippery on the left. It was Nico Rosberg who did the outing. We had been talking about his father, Keke, who lifted the 1982 Formula One word championship in 1982, despite winning only one race. Rosberg junior, recalling the Flying Finn's win in Dallas in 1984, said: "It was 40 degrees and while the other drivers wore refrigerated suits, Dad was bare-chested in the sun, smoking a cigarette." Old fashioned expressions were exchanged but no one smoked in the paddock these days. Surely there had not been a smoker in the sport since Jan Magnussen in the late 1990s. "No, you're wrong," said Rosberg. "There's one driver who lights one cigarette after another. I'm not naming names." But who could this be? This is F1 2012 and today's drivers look like toothpicks in overalls. They have never been this fit. We spend as much time talking to Jenson Button about his triathlons as we do discussing his racing. Surely no one in F1 actually smokes? And then someone mentioned the name of Kimi Raikkonen, the party animal, and everyone started sniggering. 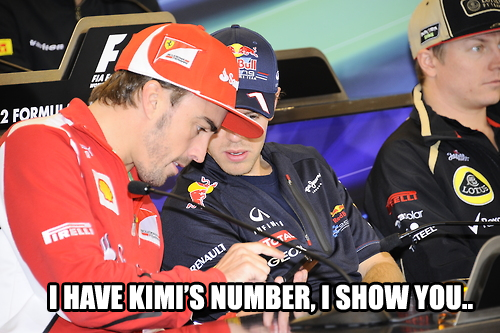 "Yes, that's it, it must be Kimi!" This, of course, may have been an awful slander. 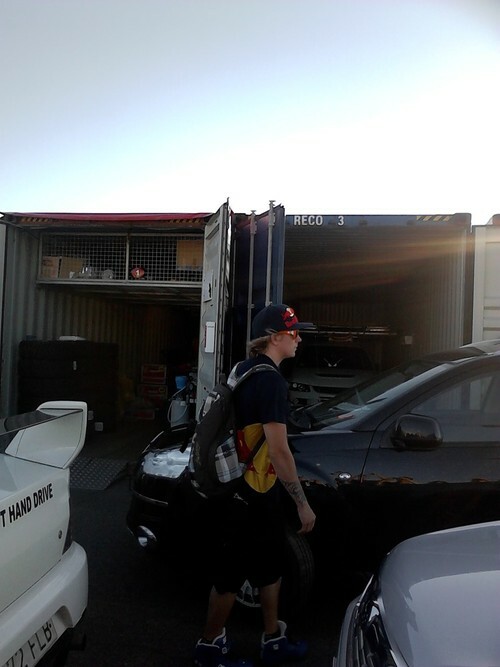 Raikkonen may not smoke at all. But, somehow, the notion fitted. Because the Finn is the throwback driver in the paddock. In the last race, in Abu Dhabi, his race engineer came on the radio to tell him about Fernando Alonso, who was chasing him down in his Ferrari. The Finn, the world champion of 2007, did not take kindly to that. "Just leave me alone," he said, impatiently. "I know what I'm doing." Later in the afternoon the same engineer, this time a little more nervously, decided to make another communication, this time telling him to remember to warm up his new set of tyres. "Yes, yes, yes, yes," came the irritated response. "I'm doing all the tyres. You don't have to remind me every second." After the race, when the 33-year-old Raikkonen had won a grand prix for the 19th time, Button reflected on his old rival. "I don't speak to him very often because I don't normally get an answer. He's a man of few words. But I flew back from Korea to Japan with him recently and I had a couple of beers with him and he opened up. He's a good guy." But why is he so quiet? Maybe he was shy, Button was asked. "I think he's insecure," he said. "But he really deserved to win. He's been so close all year and I've been saying all year that Lotus are going to win a race. I just didn't say it at Abu Dhabi. Kimi is a true racer. He came back for the racing, which is great. He doesn't enjoy anything else in the sport, it seems, apart from the party afterwards if he wins. So I'm happy for him. He hasn't been in that position for a while." F1 racing - at the moment I like it! Q: Kimi, winning the third to last race of the season is late but not too late. Before Abu Dhabi, did you still believe that it would happen this year? Q: When looking at your qualifying stats, it’s hard to believe that you are third in the driver standing. What happens with you between Saturday afternoon and the chequered flag? Is there a switch that you flip that gives you that extra pace? KR: No. It is more simple than that: our car is much more competitive in the race compared to others - and compared to qualifying with its one lap necessities. You have the same phenomenon with Ferrari: they are also lacking qualifying pace, but are right there in the race. We simply don’t have that one-lap speed that some others have, but for some reason our car is pretty good in the race. Q: So you have got used to the situation that qualifying is a bit of a pain - and then you can squeeze everything out of the car in the race? Q: What makes for a successful comeback? Why did it work for you and not for another famous name on the grid? Age, car, determination? KR: I have no idea. Sure, you have to have a good car and a good team, but that is only one side of the coin I would assume. There are many factors involved and to be honest I do not have a clue what they are. There is no right or wrong way to stage a comeback. Sure, Michael Schumacher’s team is much bigger than mine, but we have good people, good people around me - and we can go for things. I was lucky to slip into F1 again as if I hadn’t been away - as if those two years melted down to one day - and the chemistry with the team worked from day one. Q: Does 2012 satisfy you? KR: You always want more. It is a bit sad that we couldn’t really fight for the championship, but I think that nobody really expected us to do so. Hopefully we put ourselves in this position next year. Q: Did you come back believing that you really could go for the title? 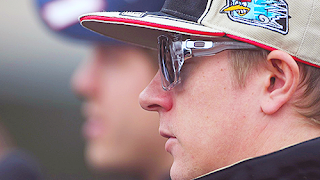 KR: Maybe not this year, as I knew that the team had a difficult 2011, but I was sure that we would do well. Q: What is good about your car? KR: Overall it is a strong package. There is not one thing or part that is so much better than others. In other words there is not really a weak point in the car - and that is the reason that was making us so strong. Sure we need more straight-line speed, but as I just said, the strongest part of the car is that there is not really one thing bad. Q: With signing you, the team hit the jackpot. How much influence do you have in the team? Are you one of those drivers who are the secret team principals of their team? KR: Ha, is that so? (laughs) Well I don’t need to walk much in the race gear, so probably the impression of a sophisticated walker comes from there. I will monitor it. 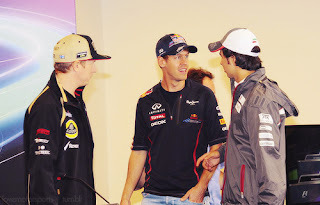 Q: For so long you were one of the contenders for the title, but since Abu Dhabi that dream is over. That race left just Sebastian Vettel and Fernando Alonso. Who is your favourite - and why? KR: I would say that the Red Bull has been the strongest car this year, but then they have been retiring a few times. On the other hand the Ferrari has been quite reliable, but isn’t the fastest car. Maybe a bit of a similar story to us. So my guess is that Red Bull has the upper hand if the car doesn’t break down. If it is a normal race and no retirements then Red Bull should make it. Q: Sebastian said that you come closest to being a friend among all the drivers. What is the basis for a driver friendship? KR: Ha, I met Sebastian a long time a go in a race. He was a young guy then and I started to talk to him. Ever since that time we talk to each other when we meet. He is a straightforward guy and I like that. Q: But it’s not like you are taking holidays together? KR: No, but we used to live close to each other before he moved to his new place and he has spent quite a bit of time in Finland with his Finnish friends. And yes, I also would consider him a friend. Q: Have you ever wondered why you are so popular after your comeback? Has the paddock realized that one rowdy character is worth more than 10 streamlined yes-men? Q: Coming to this weekend, this is the first Grand Prix in the United States since 2007 - and the first on a track purpose built for F1 racing. What is your impression so far? KR: First of all, it looks fantastic and from what I have experienced on the computer it also must feel fantastic to race it. I am very much looking forward to getting into the car tomorrow and getting a taste. Superficially you have to say that with the many colours it looks like a piece of art, so let’s hope that it is also arty to drive. Q: You look set for third place in the drivers’ championship, so with no big surprises looming you must already be focusing on 2013. What are your ambitions then? KR: I hope that we will have a good car - and the indications point in that direction. It will be a bit easier to start into the season because now we know what to expect from each other in the team. So we will definitely try to do better than this year, but everything revolves around a good car. Q: How long are you planning to stay in F1 racing? KR: I have a contract until the end of 2013 - and then we will see. 2013 might be my last year - and it might be not. You never know. At the moment I like it. Kimi Raikkonen looks set to be the first driver since Nick Heidfeld in 2008 (BMW) to finish every race in a complete formula one season. 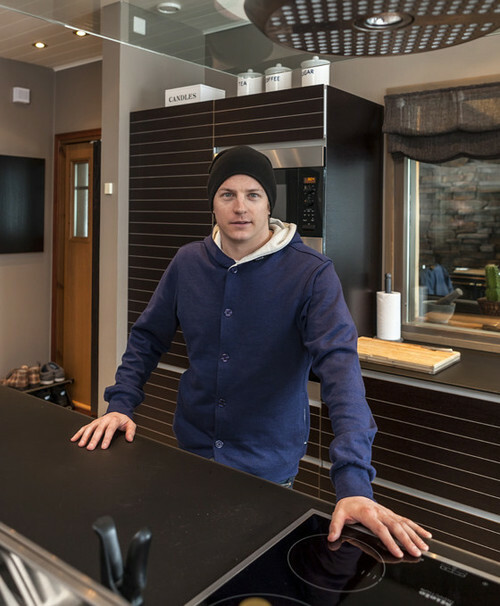 The Finn’s rare feat, delivering him an almost certain third in the drivers’ points standings, has coincided with his return to the sport with Lotus after a two-year rallying hiatus. “Our record shows that the team can build a reliable car and that I know how to drive it,” said Raikkonen. Meanwhile, the former McLaren and Ferrari driver gave the same three-word answer – “Never give up” – to three separate questions in an interview for F1′s official website. Lotus F1 Team took a formation finish with Kimi Räikkönen in sixth and Romain Grosjean seventh in the United States Grand Prix at the Circuit of the Americas, Austin, Texas this afternoon. 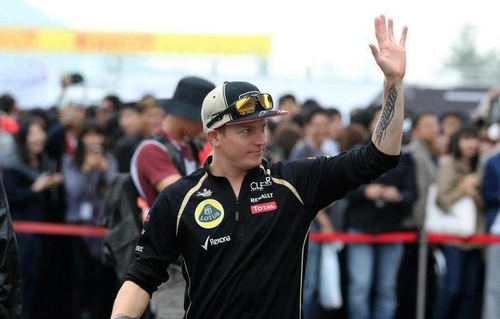 Kimi maintains third position in the Drivers’ Championship on 206 points; 16 ahead of Lewis Hamilton in fourth. The team remains fourth in the Constructors’ Championship on 302 points; an increased 166 in front of Mercedes AMG Petronas F1 in fifth. 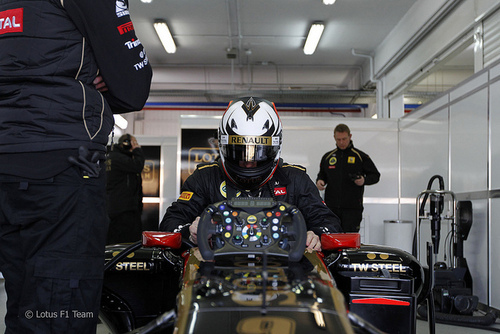 - Kimi and Romain both started on used medium compound tyres. 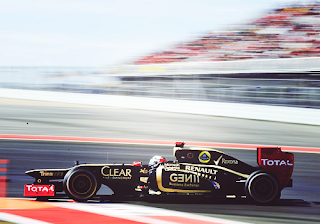 - Romain pitted for new hard tyres on lap 9, Kimi on lap 24. "It was an okay day, but not a very easy one for us. I got a bad start and then I touched with a Force India at the second corner so I lost a few more places. After that the car was okay and I could get past some of the others. Unfortunately, when it got cloudy it got too cold so the tyres stopped working and that’s where we saw Jenson [Button] get past. Basically, it was a race where we were just depending on the tyres to be in their window. I’m still 3rd in the championship and we’ll do everything we can to maintain this position until the end." "Today wasn’t as good as Abu Dhabi obviously, but with both cars in the points we’re quite satisfied. The first part of the race created some expectations that we could have been in a position to fight for a better result, however the race didn’t play out that way. We had a small problem in Kimi’s pit stop and lost time there. Romain made a mistake behind Nico Hulkenberg and lost the opportunity to do a better job, but he had a very strong race from there and came back well. In the end, Red Bull, McLaren and Ferrari were faster and there wasn’t anything we could do. It’s good to gain some points, plus we know we have better performance still to come from the car and the ability to achieve better results, so we’re looking forward to Brazil." 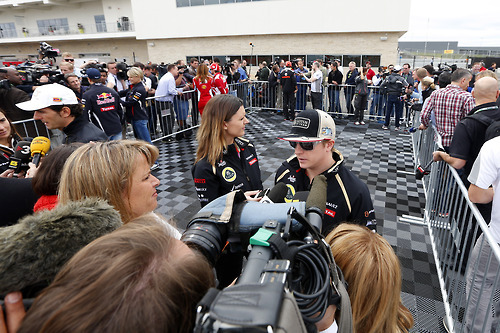 An exciting inaugural qualifying session at the Circuit of the Americas saw Kimi Räikkönen qualify in fifth. A gearbox change for Romain will see him start from ninth on the grid for tomorrow’s United States Grand Prix; with Kimi inheriting fourth position as a result of his team-mate’s penalty. What are your thoughts on qualifying? We’re certainly happy with today. It was a good qualifying performance from both drivers and we’ve shown that the car has improved pace in qualifying trim with the updated exhaust configuration which is a big positive. Unfortunately for Romain, we had a gearbox issue with his car this morning which means he’ll take a five place grid penalty but we know the car has good race pace; with a clean start from both drivers there’s no reason we can’t be up there challenging for a podium spot again. How difficult has it been to get up to speed with this new circuit? It’s been a bit of a struggle for everyone I think. We’ve seen a very green surface, low track temperatures and tyres which are really far too hard for what’s required. The circuit has started to clean up significantly which is allowing the car and tyres to behave in a much more normal fashion and it now seems to be relatively easy to run very long stints on either compound. What are your thoughts in terms of strategy for tomorrow? As per the last few weekends, it’s highly likely that we’re looking at another one stop race. The decision will be whether to stop early and make the jump or whether to spend the most time possible running the option tyre, so that’s what we’ll be analysing tonight. Are we feeling optimistic heading into the race? I think so, yes. Our race pace on Friday looked promising and – as a rule – the car has been kind on tyres so there’s no reason to believe we shouldn’t be aiming for another strong result. 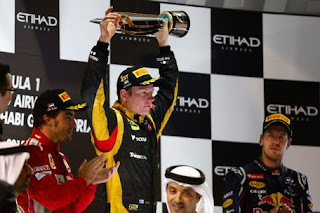 Kimi Räikkönen has taken his 19th Grand Prix victory – the 48th win for an Enstone team – with a glorious day-to-night victory in the Abu Dhabi Grand Prix. Kimi made an excellent start to take second place at the start from fourth on the grid, then capitalised when Lewis Hamilton’s McLaren retired. Romain Grosjean did not finish the race after being involved in an incident for which Sergio Perez was deemed responsible. 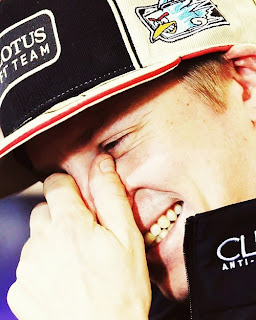 Kimi maintains third position in the Drivers’ Championship on 198 points; a diminished 47 shy of Fernando Alonso and an increased 31 ahead of Mark Webber. The team remains fourth in the Constructors’ Championship on 288 points; a reduced 30 behind McLaren and an increased 152 in front of Mercedes. 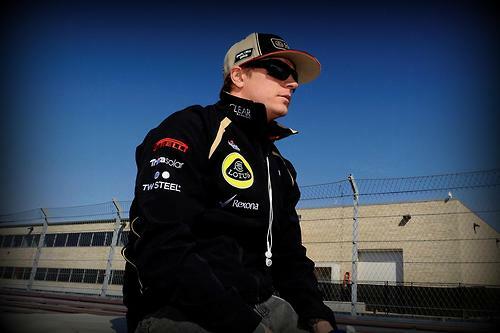 - Kimi started on soft tyres, pitting on lap 31 for a set of new medium compound rubber. "I’m very happy for the team, and for myself also. You never know what’s going to happen during the race; the safety cars made it quite tricky, but I’ve had similar races many, many times this year. Today we had a clear circuit to be able to use our speed. Perhaps we were not the fastest at the end, but we were quick enough and consistent enough to win so it’s great for the team. We’ve had some difficult races in the second half of the season so it’s fantastic to come back with a win." "I have one word first of all: Great. Then there are many words such as ‘relief’ and ‘deserved’. It’s obviously a very well deserved result for the team. I’m pleased for Kimi and he did a very good job. We’ve been pushing very hard all season and we’ve nearly had it before. There’s a little frustration not to have had a win sooner, and we have been waiting for it, but it’s a fantastic feeling to finally take that victory and a superb reward for the team. 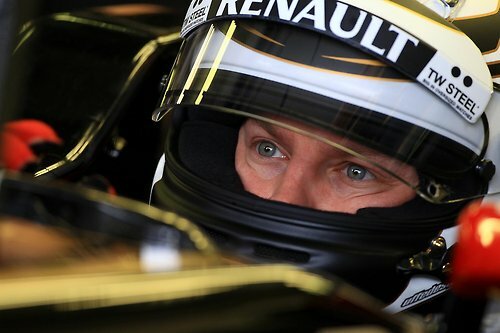 It’s great for Formula 1, it’s great for Kimi and it’s great for our team." "When you are as happy as this it is hard to avoid lapsing into cliché. Despite being tantalisingly close several times this year, we have waited a long time to return to the top step of the podium. 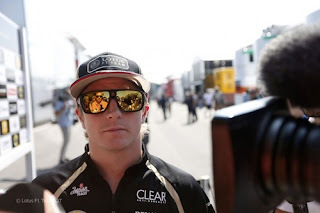 It is a massive tribute both to a flawless drive from Kimi and to the tenacity of the entire Enstone team for never having taken their eye off the prize all year. With two races left in the season we go on to Austin with a spring in our step, invigorated to do it all over again and see what we can achieve." "It’s just an awesome feeling to finally win a race; the first victory for the Enstone-Viry partnership in its present configuration. All season the chassis-engine package has been strong and everyone has worked incredibly hard in the last few weeks to successfully introduce new parts to get that last piece of performance. 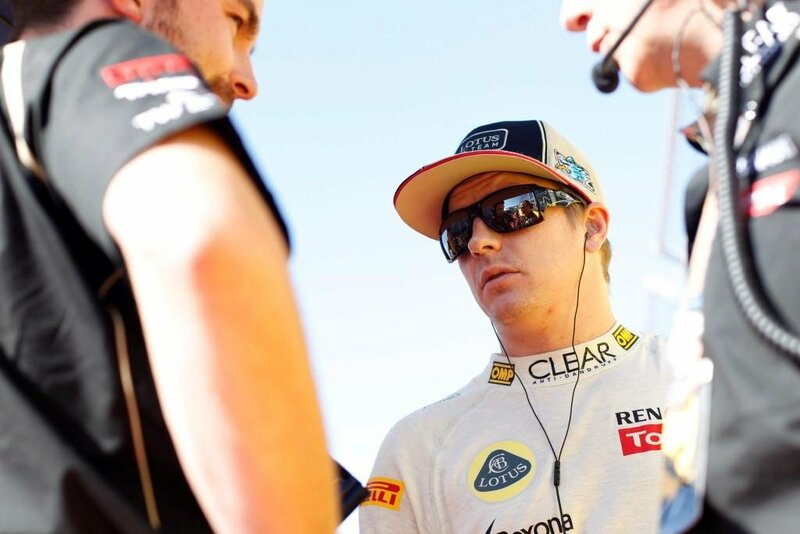 It all worked out beautifully today and hats off to Kimi for judging it perfectly." Well, as I said in India, I felt the lap time speed was there in the car to fight for the top positions. Obviously, we just couldn’t use it at all after being held up by some others during the race because of a poor qualifying result. So we went to Abu Dhabi with a good feeling from the car. If we could put everything in place with the qualifying and get a good start, the sky was the limit to fight with the leaders for the top place. I had one experience earlier at Abu Dhabi to be forgotten, while I had my last race with Ferrari there and there was nothing left from that car to get any kind of result. Now everything was different. We had a pretty solid practice, we tried some new parts for the last two races, but we got it right with the set-up, as well. I was quite pleased with how it went in the qualifying sessions. Obviously, it was tight as ever, but the lap was good enough to put us to P5, and, eventually, to fourth from there on, as Vettel got a penalty afterwards. Then next on the agenda it was up to us to get a good start. I was fired up already going to the installion lap, while I felt, everything went so strongly in the practise start. Then we got the launch perfectly in place, and I was in front of Webber and Maldonado before reaching the second gear. Hamilton had more speed, no question about that, but we didn’t have any problems to follow him. It was as predicted, this could have happened already in India. If we are free to follow the leaders, we can do it. But if there are some people in between, you just cannot do it and the leaders disappear quickly from us. This time we didn’t have to wait until the pitstop, while Hamilton had some problems and stopped. That’s how it goes in motor racing. You hope to have the quickest car, but when you have it, you have to finish the race, too. The points are shared only after the flag. We had the lap time speed and I could control the race quite easily until the second safety car came in. Then everything was open again. I knew I had to be able to gain a gap back in the few first laps, I really went for it – and it went ok! We knew Alonso was there to make every effort to win this one. I saw him coming closer, but, obviously, there was not that big pressure. It’s completely different to come closer compared to try to overtake a fast car in that circuit. It was in our control until the finish, but I have to confess, it would have been much easier, if the flag had been waved 1-2 laps earlier. Well, winning means everything for me. It was just a great feeling to clinch the first one of the season, the first one with the new team, and get the 25 points for the first time in my life. But all in all, it was a great result especially for the team. They have worked so hard all year long. They have had some difficult moments and we all have been disappointed after feeling how close we have been to the P1 without ultimately getting it. Now it’s done. We all have the best reason to feel happy. Hopefully we'll get more of these moments together again as soon as possible! A tightly fought qualifying session at the Yas Marina Circuit saw Kimi Räikkönen net a fine fifth position on the grid whilst Romain Grosjean took tenth for tomorrow’s Abu Dhabi Grand Prix. Where do you think the car should be on race pace? Do we fear being stuck behind other cars as in the Indian Grand Prix? Obviously, we took a risk, tried something different to find a couple of tenths more for qualifying, and the whole weekend in India went in a wrong direction at the same time. The Indian Grand Prix is one of those to forget quickly. We had a good car to get good lap times in the race. But while we stuck behind a Ferrari after the start, well, there we were for the whole race. I tried to pass, but, it was a simple fact, there were not enough speed in the straights to attack. Once I was in front of the Ferrari, but it didn’t last long. It was my decision to make the changes to the car after FP3 on Saturday. That makes it an even more bitter pill to swallow. It could have been totally different ball game from the better position in the grid. Now we shall never know. We were seventh, got six points and while the leaders got much more. I’m happy to stay on with Lotus F1 Team. The deal is done and now we can focus to put together some good results in the end of the season. We are heading for the next race in Abu Dhabi. It’s a different challenge while the race will be a mixture of a day and an evening race. We start with the sun and finish with the lights. It’s a so called Twilight race. I’ve experienced it once with Ferrari. Now I want to improve from that and get the first points - hopefully a podium - from there, as well. The car should be at its’ best in the kind of layout of the circuit. There are not too many long straights and some lower speed corners should be good for us. We push really hard to get a solid qualifying session like we had in Korea. You need to be up there in the first two rows to have a chance for a podium finish in this race. That’s our target. Let’s wait and see, how it goes. What have you learnt from your return to Formula 1? This season has shown me that I still love racing as much as I ever did. Obviously, I would have not come back to the sport if I did not feel like this. Driving a Formula 1 car still gives me the same inspiration and I feel the same passion for it. Lotus F1 Team is your fourth team in Formula 1: how have things gelled? I have been very happy with the team; how they work, how they approach the races and how they invest in developing the car. 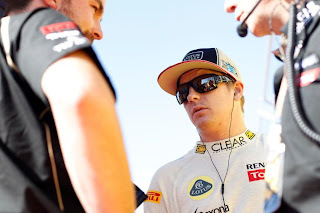 I think with the progress behind the scenes at Enstone we could be fighting for the podium even more often next year and also be able to make a stronger challenge for the Championship. We, and around 500,000 other people, recently saw you signing an enforced contract on YouTube. 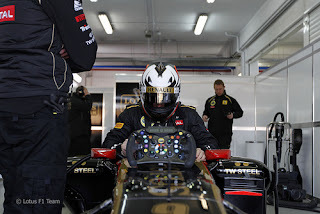 How civilized was the process with Lotus F1 Team in comparison? Well the team did not need to tie me up and blackmail me with a photo album, unlike certain other contracts you may have seen me sign recently. That was not necessary on this occasion. How strong is your motivation heading into the last races of this year and looking ahead to 2013? My motivation is as strong as it’s always been. I’m keen to race on. How can you build on your experience from 2012 next season? We have proven as team that we can build and develop a strong and reliable car. This year has been a good platform to put down strong foundations for what will hopefully be an even better season next time around. We know what we need to do to improve in some important areas, which should help us get even better results next year. All in all I’m looking forward carrying on working with the team to achieve more good things in 2013. What have you learnt from this year? I think there were a few people who had doubts about how I would perform after being away for a while. Personally, I didn’t feel I stopped racing at all. I may have been doing something different with rallying, but after coming back to Formula 1 I immediately felt fit enough – and fast enough – to start racing again. My hunger for winning is exactly the same as always and I think I’ve shown that I’m capable of fighting for victories. Obviously there have been none so far this year, but we have come close a few times and for sure we’ll keep on trying for as long as it takes to start winning again. What’s the main focus for you in 2013? Of course, the main thing is to do my very best every time, every weekend, every race. I think to be able to perform better in the races I have to find more from myself and from the car in qualifying. This season has shown that you have to be on first two rows to be able to win every time. It’s important to improve our grid positions for 2013. That’s one of main targets for me. A closely fought qualifying session at the Buddh International Circuit saw Kimi Räikkönen take seventh position on the grid whilst Romain Grosjean was just edged out of the top ten session, qualifying in eleventh place for tomorrow’s Indian Grand Prix. "We changed the car after this morning’s session and we were quite confident heading in to qualifying. Unfortunately, we didn’t seem to have any grip this afternoon so it was much more difficult than we thought. 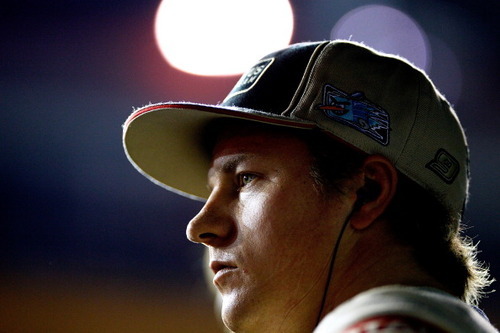 I’m quite disappointed to be starting from seventh as I thought we had a much better car than that." "It’s going to be a tricky race to move forwards." "It was a disappointing result. Kimi had a very good session in the morning and we were looking forward to a strong qualifying. Unfortunately, neither driver felt they had the grip levels they had enjoyed in the morning. 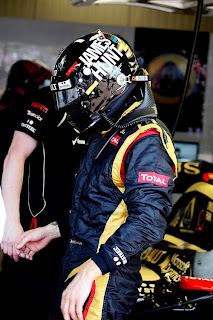 Romain reported poor overall grip in all corners, whereas Kimi had issues with the low speed corners - a nervous car on entry and poor traction on exit - which are typical comments made about a car which is lacking in all round grip." "Qualifying seventh behind two Red Bulls, two McLarens and two Ferraris shows that we have the fourth fastest car here. We will do what we can in the race but we’ve seen very low tyre degradation and overtaking is difficult due to the circuit layout and DRS setup." What strategies do the tyres allow? "We think one or two stops will be the preferred strategies and will work tonight to see which will suit us best." I’m travelling to India for the first time. My feeling is great. I had my birthday last week and it was one of those memorable ones, again. Personally I would now like to thank all my fans for those nice things you have sent to me to celebrate my birthday. It’s nice to be supported in such a amazingly inventive way, like you all have done! Now we are preparing ourselves to the Indian Grand Prix. Obviously, it is a brand new place for me, but it shouldn’t be a problem to learn the place and get things going on as smoothly as possible. At least, there were no problems in Korea, which was the first new circuit for me during this campaign. We started working with the exhaust system in Korea. Now it’s race number two with it, and we hope to get more and more out of it until the end of the season. There are some other new parts, as well. The team is really pushing hard to give us a competitive car for the last four races. We know this circuit will be very dusty and slippery in the beginning. The layout looks quite interesting, so I’m looking forward to get first grips with it. Now we have been in third position since Monza. Lately we haven’t had the speed to fight for the podiums, but we have not given up anything. We go to every race to do our very best. We are not expecting any favours from anybody, but we rely on our own work. When we are able to get everything right in the car, it should be enough to fight for the top places, too. First of all we need to have a good and solid Friday, then a warm Saturday morning without any major problems – and after that we attack the qualifying session. Without a good speed in Q3, it seems you can forget the fight for the podium places. It would be meaningless to set any targets. We just have to keep working as hard as we possibly can to score strong points in the both championships and see what happens from there. So it¹s four races to go in this season, there are as much as hundred points to gain and we are now 48 behind the leaders. It¹s a tough call in the championship, for sure. However, I have experienced the similiar kind of situations previously; sometimes it has not been easy at all, but we still managed to get through some how. Today you never could know beforehand what could happen in motor racing tomorrow. At least I can promise to all you fans, we will give it our best shot! 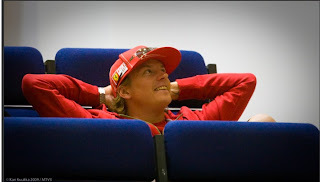 Right now it doesn¹t look like we could be catching Vettel or Alonso, but we will try as long as it¹s possible. We got some important new parts to Korean Grand Prix. I had never tested them before, so it was pretty interesting weekend all way through. It was not the easiest of races. We got the car working better and better, but there was not enough speed in the race ­ for that circuit, any way. I was pleased with the speed in qualifying. It was not our best lap of the season, but it was good enough to get us a decent position in the starting grid. The start was good and I had my chance to win a place. Then I had to back off, and, obviously, that was it. After that we raced for the fifth place. We had some rough time behind Hamilton, but finally we got some clean air and managed to seal our P5 for the rest of the race. I felt the new exhaust system giving more potential to the performance. However, this was the debut for it, so it¹s natural we need some time to optimise it and get more out of it in the future. Obviously, it will depend on the circuit as well. Some places suit better, some not that good. So hopefully we get more out of the system in the next race in India. India will be a new place for me, like Korea was. I didn¹t have any problems to get acquinted with that circuit, so I don¹t expect it to become an issue in India, either. 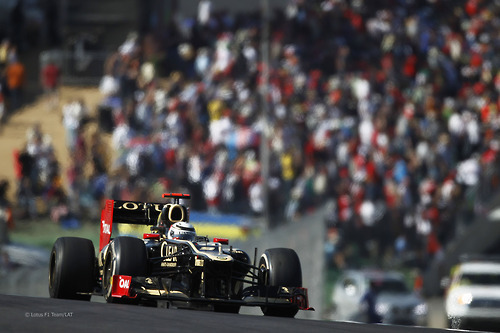 Kimi Räikkönen took fifth while Romain Grosjean finished seventh in a fast-paced and intense Korean Grand Prix today. 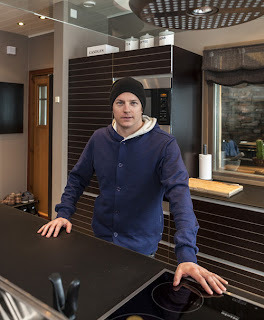 Kimi maintains third position in the Drivers’ Championship on 167 points; 42 from Fernando Alonso ahead and with an increased 14 point buffer to Lewis Hamilton behind. The team remains fourth in the Constructors’ Championship on 255 points; 29 behind McLaren and 119 in front of Mercedes. - Both drivers started on Pirelli’s super soft compound tyres. - Kimi pitted for his first set of soft rubber on lap 14, his second on lap 35. A closely fought qualifying session at the Korea International Circuit saw Kimi Räikkönen clinch fifth position whilst using the team’s new Coandă exhaust system, while team-mate Romain Grosjean with start in seventh place on the grid for tomorrow’s Korean Grand Prix. How did the new Coandă exhaust system work? How do the different tyre compounds perform here? It's a busy time to be a Grand Prix driver; two races in eight days. We just finished the very tricky weekend in Japan and are now preparing ourselves for a brand new challenge of the Korean Grand Prix. As I said before going to Japan, whatever we achieved in Suzuka before, doesn¹t help us this time. Unfortunately that¹s how it was. We had to work really hard to get something out of the Japanese Grand Prix. It all went wrong on Friday. We lost most of the track time to get set-up work done in a right and preplanned way. After some major changes for Saturday, we found the speed in the qualifying, but then I pushed a little bit too hard in the last flying lap, missed it in the Spoon Curve, and lost a starting position in the second row of the grid. The race was one of the most difficult ones during this season. Suzuka is a narrow circuit and if you miss the speed, there is nothing else to do, but look at the mirrors and try to defend your position to take home some points. Well, we managed to get P6 and eight points again, like in Singapore. Vettel had the speed of his own and he got close to Alonso in the championship, so there are now two people, we have to beat in next few races to get closer to the top. I've never visited Korea before. I¹ve seen a Korean Grand Prix only on TV, so there is more than usual to do, to get the understanding, how the car goes there. We will have some interesting upgrades. I wish the best from them. Hopefully they work well and we have a nice and clean practise to test them enough. As always it¹s interesting to go and have a race in a new circuit. You never know beforehand, what will happen, but I have a good feeling, it should not be that bad for our team. Let's wait and see, what is the speed of the car for the Korean Grand Prix. 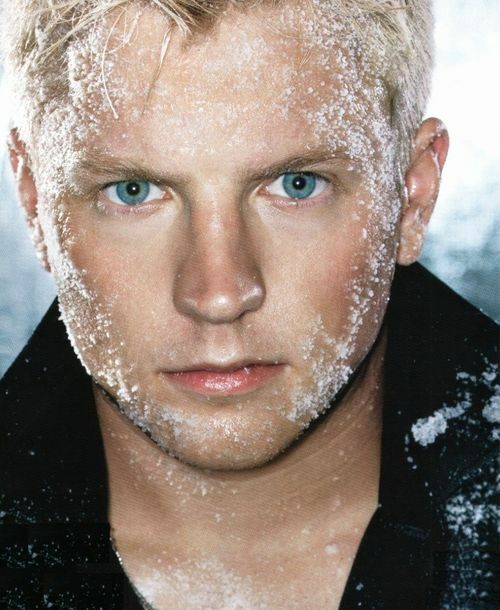 Kimi Räikkönen came home a solid sixth, maintaining his third position in the Drivers’ Championship. The team remains fourth in the Constructors’ Championship with increased gaps of 103 points to Mercedes behind and 24 to Ferrari ahead. 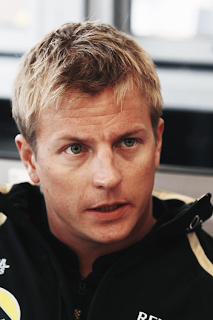 - Kimi pitted for his first set of hard compound tyres on lap 13, then his second on lap 30. "Sixth wasn’t the result we were hoping for but unfortunately we didn’t have the speed to do better today. The start was very tight ; I was alongside Fernando [Alonso] straight away and he kept moving further across until there was nowhere left go. We lost some time there and our second pit stop wasn’t the best, so overall it was quite a difficult race. The good thing is we still managed to score points to stay in touch in the championship." "Obviously, it hasn’t gone as well as we expected. We could see in Singapore, when Romain was back on track, that the other drivers were putting some pressure on him at the start. Here it was a little bit easier, but he made a small mistake misjudging his pace compared with Mark, which was a bit higher. I think he has made some progress, but it’s unfortunate that this has happened again in these circumstances. 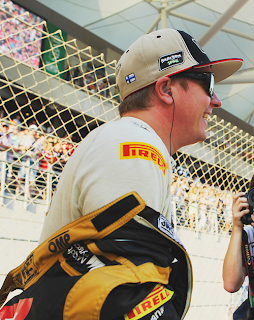 With Kimi, the car’s pace was not as good as we were expecting. Starting seventh we had higher hopes, but if you don’t have the pace completely it doesn’t work well. 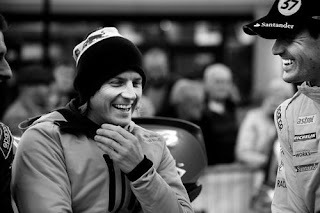 We couldn’t put everything together in order to make his race more successful and gain more places." 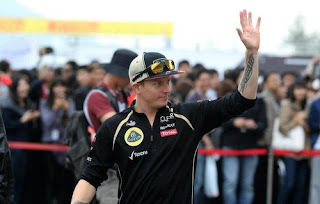 Kimi Räikkönen will start the Japanese Grand Prix from P8 on the grid after Saturday’s qualifying session at Suzuka. Kimi span on his fast lap. How do you assess today’s qualifying performance ? How are we looking for the race ? How do the different tyre compounds perform here ? Well, we've been struggling a bit to gets things going on our way in the last few races. This is one of the tightest championhips I've ever been with and while you don¹t get everything nicely together during the race weekend, you cannot expect the best results, either. In Monza and in Singapore we¹ve lost some ground to the leaders in the drivers¹ championship. Obviously, my main goal is get closer to the top and bring good points to team, as well, but one thing is for sure ­ we won¹t give it up and we will fight until the very end. Usually coming to Japan has meant the the finish of the season being very close, but not anymore. We have still six more races to go. For me Suzuka is one of the circuits I really enjoy, as being that type of racing circuit from the good old times. It's a track, where you have to have a well balanced and solid car to go through all those different kind of corners. The 130R is always a challenge and there are many more alike. Winning in Suzuka 2005 was one of my best ever races, but it didn't matter that much, as the championship was lost a race earlier in Brazil. Hopefully we got it right again this time, while it really counts! We should get some new parts there, hopefully the weather stays also good, while setting up the car the way I like it depends much on the weather and on the circumstances. We know the speed is there in our car. We just have to find the right set-up to maximise it every time. We will give it our best shot to be on the podium, but the races are going to get more and more difficult with other teams constantly pushing with new development parts. Obviously, we have to make a step forward from Singapore, where we were nowhere to fight for top places. As usual it's impossible right now to predict how our car goes in the next race. We have to wait until Friday practise. Then we know more. Well, it was my third visit to Singapore, and the first time I left the Marina Bay circuit with some points in the pocket. P6 is better than nothing, but, obviously, while we lost seven points more to the leaders, there is no reason to be happy with the result. It was the same story we had in Monza two weeks earlier. We knew on Friday, we lack some speed from the car. It made the weekend very tricky on our side, again. The lowering temperatures of the night race didn't help, either. The layout of the street circuit makes it very tricky to pass people in this race. Simply there is no place to have a real go and try to overtake slower car. Obviously, only with a good qualifing session you would have a good place to fight for the podium. We lost the game in qualifying. The second set of new supersoft tyres didn’t work that well and left us out of Q3. The race itself was a boring one. I spent most of the time behind Mercedes cars. There was no way to pass them. It was just a matter of being patient and wait until the pitstops or something else happening to them. The first safety-car situation hurt us, too. We got something back from the second SC, and, we could have had one place better result, but I hate to speculate, while you cannot change the race anymore. We really need some more speed to fight for the better positions – especially in qualifying. To go from P3 to last six races is no giving any favours to us. It’s so tight pack around us and while the leader is getting more points compared to us, that doesn’t make our life any easier. Let's wait and see, what we are able to achieve in Suzuka. There will be new parts, but we will have to wait until the first practise on Friday morning to learn, how the car feels back there. Kimi Räikkönen fought back from twelfth on the grid to maintain his third position in the Drivers’ Championship with a battling sixth place in the Singapore Grand Prix. Romain Grosjean finished close behind in seventh after a gruelling race with two safety car periods and a number of retirements. The team remains fourth in the Constructors’ Championship, 95 points ahead of Mercedes in fifth and 14 behind Ferrari in third. - Both drivers started on Pirelli’s super soft compound. - Kimi pitted for his first set of soft compound tyres on lap 13, and his second set of softs just as the first safety car came out on lap 32. We had a difficult start to the weekend but the team did a good job to recover. Qualifying was frustrating after both cars showed strong pace in Q1 and the first part of Q2 but ultimately fell short of what we were hoping for in the end. The race pace from both cars was good and although we were unlucky with the first safety car our strategy worked well. After a difficult weekend for us Kimi is still third in the Drivers’ Championship and we have not lost too much ground to McLaren and Red Bull in the Constructors’ standings so that is a big positive. The fact that we feel our lack of performance here was quite unexpected shows our ambition and our priority for the rest of the season will be to make sure we’re in the sort of positions we know we can achieve right from the start of each weekend. Kimi Räikkönen will start the Singapore Grand Prix from P12 on the grid, after a hot and sticky qualifying session at the Marina Bay Street Circuit. The grid results mask significant improvements found in the E20 overnight, illustrated by Romain setting the fastest time in Q1 and the fourth fastest time in Q2. The car seemed to be better than yesterday – why was this ? I have had two nights at Singapore racing a Grand Prix. Obviously, I¹ve got zero points so far, but I did really enjoy both weekends in Marina Bay circuit area. For me Singapore represents one of the best new places we¹ve got in the F1 calendar. What makes it so special, is the timing of the start, for sure. It¹s nice to do your routines in a different time compared to usual. Go to bed in very early hours, sleep until afternoon, eat when you normally start packing your gear in the paddock etc. I don¹t understand some people making a big fuss of the different time for racing. While we put the helmets on and start the race, there isn¹t anything different with the feeling you get in the car. They have an excellent light system all around the circuit, it¹s made of normal streets, so it¹s bumpy, it's very physical and it¹s great fun to drive there. I did this Grand Prix twice with Ferrari. 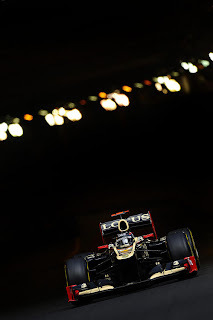 It was that first ever night race in the F1 history in 2008. We were in good position until the pit stop, which was caused by a safety car situation, and we lost it there. I was fighting to get some points, the car was fine, but I crashed to the wall racing in the fifth place. Well, I¹ve heard I still have got the official lap record from that race. Actually I finished the race in 2009, but it was one of those races with a uncompetitive car we had back then. Like always, there is no use to speculate, how we will do this time. I haven¹t run a single metre with this car in that circuit, so we will have to wait until Friday afternoon¹s FP1 to get the first grips with the place. It¹s a street circuit. It should be hot weather even at night and while we use the two softest compounds of Pirelli tyres, it should be good for our car. Obviously, we had a nice strong weekend at Valencia back in June. Hopefully the similarities with the circuit will bring also a similiar chance to fight for the top places in Singapore. The most important thing is to earn some good points for the team ­ and to myself, as well, for the championship. No doubt, it was one of most difficult weekends for us during the whole season. We knew it before travelling to Monza and, obviously, it proved to be the case, while we started the FP1 on Friday morning. Very simply we were lacking the speed, or - to be precise - picking up the speed fast enough compared to the other front-runners after coming from those few corners. The low downforce levels demanded by the layout of the Monza circuit did not suit our car. We could not hang on with the leaders in the straigths and it was tricky even with the DRS on. Obviously, it could have been a disaster, but at the end of the day, we left the Italian Grand Prix with a fifth place finish and, most of all, with ten more points in the championship table. After the qualifying we hoped for the sixth spot in the race at the best, and got one better, so it was not too bad at all. Mainly our focus is to cut the point gap to the leader, who is Fernando Alonso. We managed to cut it by 15 points in Spa. This time we lost 5 points to him. It’s never good to lose more at this time of the season, but it’s still possible to catch him. So we shall try our very best, that’s 100% certain! Actually we gained one place after Italian Grand Prix, but, for me, it’s the same, if we are second, third or wherever, as long as we are in this tightly packed group of the pursuers behind Alonso. Obviously, we would need good points from the next few races. It will be very interesting to see, how it goes, while all the teams will have a completely different aerodynamics package for Singapore. I have never scored points at that circuit before, but it should suit our car quite well. So let’s wait and look forward to what we can achieve from that exotic night race. Kimi Raikkonen and Romain Grosjean lamented the set-up choices and qualifying efforts made by the team on Saturday, which left them at a critical disadvantage during the 2012 Indian GP. 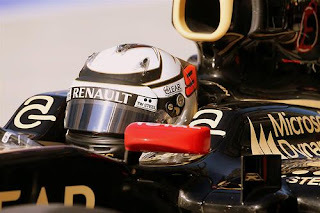 It was another weekend of 'could have beens' for Lotus, with a good car not able to perform to its full potential - according to lead driver Kimi Raikkonen after the 2012 F1 Grand Prix of India in Greater Noida. "I had a very good car today but I just couldn't do anything with it," said the former world champion. "We put ourselves in that position yesterday with the set-up we chose for qualifying, and we paid the price today." The problem was that couldn't get the speed he needed out of turn 3 down the DRS zone of the long straight, which meant that he wasn't able to get passed Felipe Massa and spent most of the race staring at the rear wing of the Ferrari instead, eventually following Massa home in seventh place. "I was not able to pass on the straight. 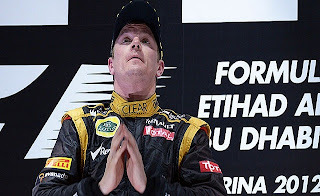 It was quite disappointing but that's how it goes," said Raikkonen. "We had the speed but not in the right place and when you are behind someone there's not much you can do."